Some people come to personal coaching as a result of a wakeup call – something that compels them to live their lives differently. Others feel stuck – wanting a change and believing there is something else out there but without knowing what that is. Still others have commitment and a vision for what their future could be. What is similar is their desire for change and awareness that it is our choice to live a life of purpose and personal fulfillment. Regardless of the issue – a job transition, a relationship challenge, strategic business opportunity evaluation, leadership development, or some combination of the above – our coaches help our clients to slow down their thinking, reconnect with their inner wisdom and surface a new palette of choices in their lives. It is our belief that our clients are healthy, creative, resourceful and whole – they have their own answers and it is our job to help them to design the life they want and to support them as they work to achieve that vision. 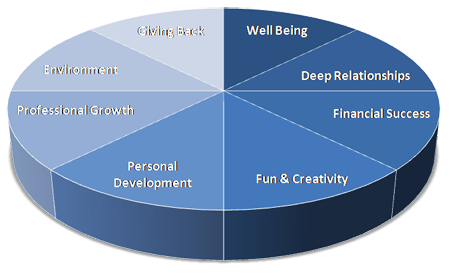 At the Hoshin Group, we take a Whole Life Approach to coaching by inventorying your satisfaction across eight segments which individually and interdependently, contribute to your overall happiness and success in life. While we may focus on one or two areas in a coaching engagement, through understanding and appreciating the interdependence of each segment on the others, you will move more quickly forward and make progress towards your goals. We also engage in a rigorous, results focused goal setting process that ensures that our goals are SMART – Specific, Measurable, Achievable, Relevant and Time-bound. The coaching process focuses on integrity, accountability, learning and effective communication, which incidentally, are the Hoshin Group’s core values. We seek to help our clients find inspiration by encouraging abundance thinking (focusing on what you want rather than on what you don’t want) and believe that by choosing our thoughts, we impact our results. Coaching doesn’t change your circumstances but it can change your outlook. Personal coaching relationships, which often take place over the phone, may be as short as a few months or as long as decades. Where the engagements are longer in duration, we are rigorous with both our short and long term goal setting horizons to ensure that we – both the coach and the client – remain focused on achieving the client’s specific, measurable and stretching goals that truly will make a difference in the client’s life. We’ve said a lot about coaching. Now let’s be totally honest. We’ll be present and intensely curious with you. You’ll do the heavy lifting, however. You are the expert in your life and business. We simply serve to help you to see your own potential and to actualize your greatness.